If you’re seeking carefree, flamboyant fun in the city then Bar Elba is surely the place to be. Situated sky-high by London Waterloo, Bar Elba is a rooftop bar specialising in funky, fruity cocktails and moreish burgers and buns by gourmet joint Dip & Flip. 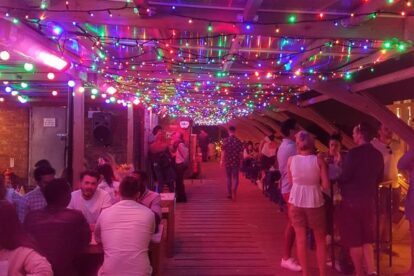 Decorated with bright colours, kitsch signage and luminous twinkling fairy lights, the atmosphere screams young and fun and the clientele match this. Expect girly hen parties, birthday bookings and groups of friends out for a good time in the capital. The extensive cocktail list offers a long list of sweet treats and I have to say, as common as it is, the Pornstar Martini is one of the best I’ve sampled. The vegetarian potato rosti burger, topped with a fried egg, also makes for an ideal bite in between draining those cocktails. Tip: be sure to sign up to the mailing list online to receive a voucher for a complimentary cocktail on arrival. There are no hidden costs involved – just a nice, thirst-quenching free cocktail waiting for you at the bar!